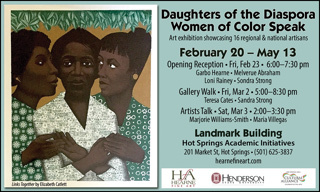 Daughters of Diaspora — Women of Color Speak, an art exhibit showcasing mixed media from 16 women artisans, opens Feb. 20 at the Landmark Building, 201 Market Street, in Hot Springs. The exhibit will run through May 13 and is open Monday-Friday 8 a.m.-5 p.m., on the second floor of the Landmark Building, with extended hours until 8:30 p.m. for Gallery Walk on the first Friday of each month. Sponsors for the exhibit include Henderson State University, Hot Springs Academic Initiatives, Hot Springs Area Cultural Alliance, Virginia Clinton Kelley Democratic Women’s Club, and Hot Springs Life Long Learning Institute. The opening reception for the exhibit is Friday, Feb. 23 at 6 p.m. Garbo Hearne, director of Hearne Fine Art in Little Rock, and curator of the exhibit, will provide a guided tour of the exhibit with artists Melverue Abraham, Loni Rainey, and Sondra Strong. Abraham is a folk art expressionist, and her artwork Harmonic Convergence was a book cover for the best seller Spirit Speaks To Sister by June J. Gatlin. Strong is an acrylic painter who expresses fondness of all aspects of culture and life through her use of bold colors and broad strokes. Rainey, a pastel artist and printmaker, has traveled and taught abroad, most recently in Kampala, Uganda. She draws inspiration from her experiences and creates abstract representations of her journey through her various roles of mother, wife, artist, educator and student of life. Additionally, artists Marjorie Williams-Smith and Maria Villegas will give a lecture on March 3 at 2 p.m., and on May 3 an artist reception will be held during Arts & The Park festival at 6:30 p.m. 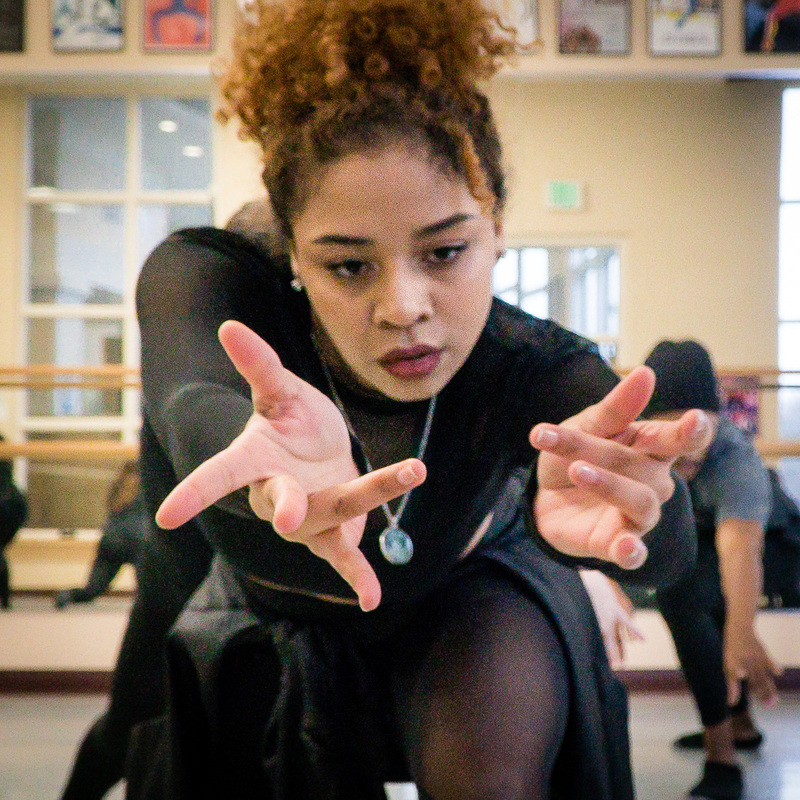 The Daughter of the Diaspora –Women of Color Speak’s featured Arkansas artists include Melverue Abraham, Teresa Cates, LaToya Hobbs, Louise Mandumbwa, Loni Rainey, Marjorie Williams-Smith, Sondra Strong and Maria Villegas. National and international artists in the exhibit include Phoebe Beasley (Los Angeles, California), Lillian Blades (Atlanta, Georgia), Bisa Butler (West Orange, New Jersey), Elizabeth Catlett (Cuernavaca, Mexico/New York, New York), Artis Lane (New York, New York), Samella Lewis (New Orleans, Louisiana), Evita Tezeno (Dallas, Texas) and Anyta Thomas (Philadelphia, Pennsylvania). 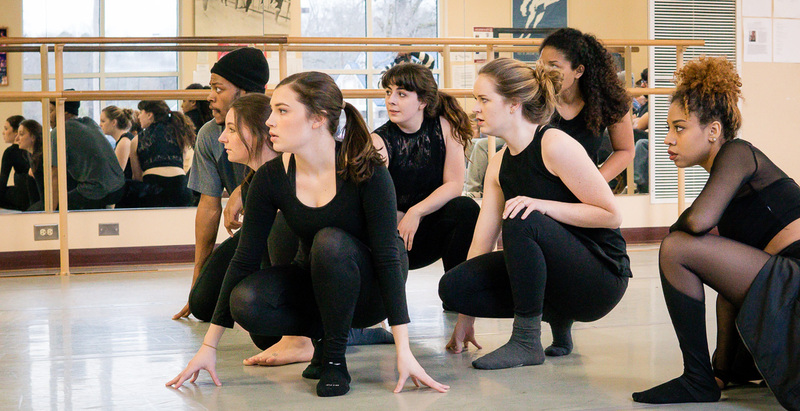 Henderson State University hosted the Debra Knapp Dance Project Feb. 5-9. 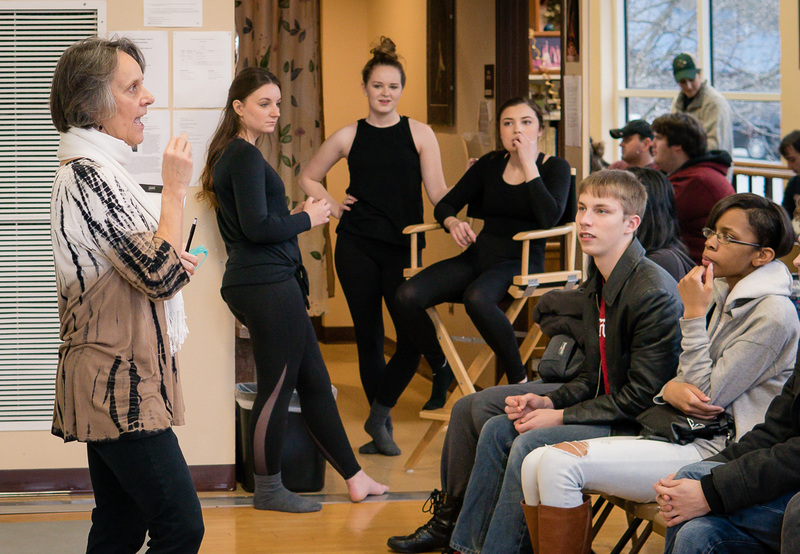 Knapp taught dance master classes and led rehearsals with the Henderson Dance Company. 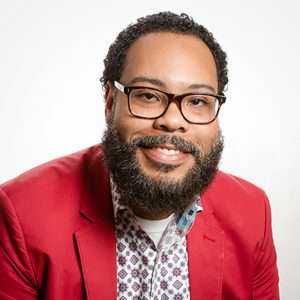 David Warren, assistant professor of printmaking and art education at Henderson State University, has been named art educator of the year by the Arkansas Art Educators Association. Warren has been a member of the Henderson faculty since 2008. The association includes teachers from K-12 and higher education. “To be recognized by these artists and teachers is something really special and it means a lot to me and to the university,” he said. 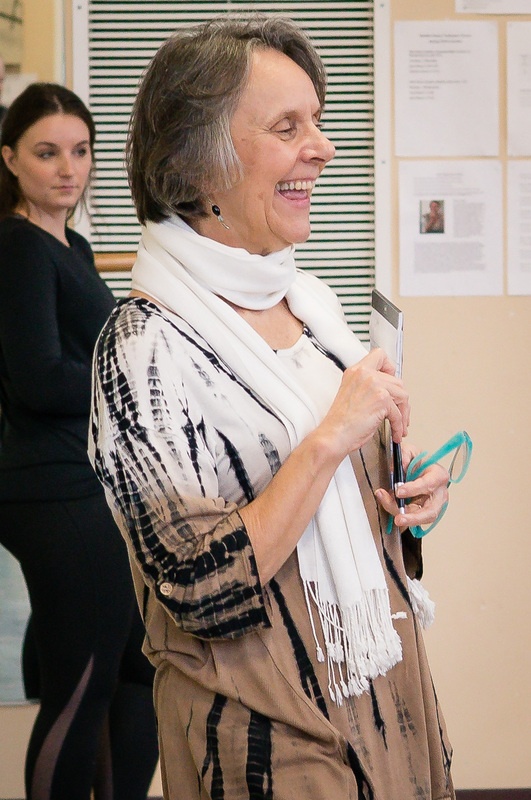 Warren organizes professional development workshops each summer for teachers where they work with Warren and other art professors and artists. One-on-one training sessions are provided in the various art studios. Other workshops target younger students. With an interest in many printmaking techniques, he shares a variety of western printmaking methods including etching, lithography, and relief printing, as well as eastern techniques such as Japanese methods. Henderson State University is celebrating Black History Month with a variety of cultural events to educate students, faculty and staff about the history of the campus. For Dr. Eric Flowers, assistant vice president of student affairs, Black History Month is an important and critical occasion. “As a child, I always admired the fact that my great grandfather was college educated and it impacted my decision to enter the field of education,” Flowers said. As a university, Henderson State has a rich history of being inclusive for students of all cultures, races and socioeconomic backgrounds. Flowers said Black History Month is a great time for discussion and reflection. 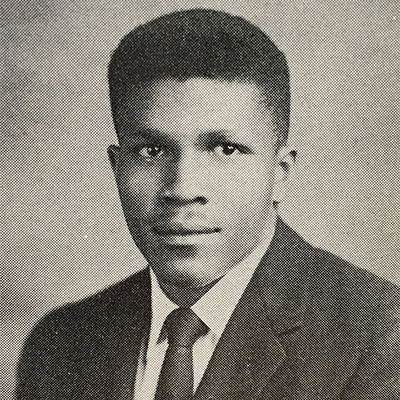 Horton graduated from Henderson in 1957, becoming the first African-American student to graduate from the college and one of the first African-Americans to graduate from a white institution in the South. Flowers is proud of the educational opportunities provided to students of color over the past 64 years and uses the significance of his administrative role to continue the legacy of assisting all Henderson students on their journey toward educational and career success. This year, the Office of Student Affairs and the Student Activities Board are hosting a poetry night with spoken word artist and motivational speaker Kendra Harris at 7 p.m. Feb. 12 in the Garrison Lecture Hall. A cultural comedy night will be held at 8 p.m. Feb. 19 in Arkansas Hall. All events are open to the campus community. Throughout February, organizations and departments will join the celebration with events ranging from panel discussions to cultural events. Check the calendar at hsu.edu for more information. 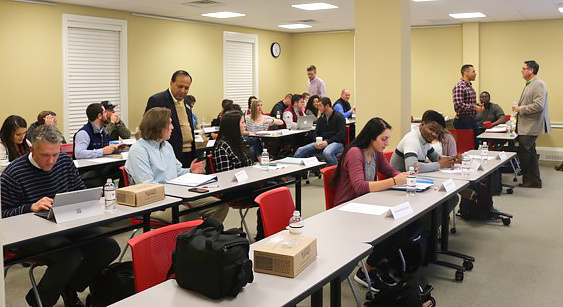 Henderson State University’s School of Business has significantly changed the pre-requisite structure for its more than 30-year-old Master of Business Administration (MBA) program. The new structure streamlines pre-requisite knowledge for motivated students, ensuring that all students start the MBA with a similar foundation. The MBA Bootcamp replaces all pre-requisite courses so that a person without a business degree can begin the program quicker, and a student with undergraduate preparation in business can get “ramped up” on subject area that they may not remember well, said Dr. Lonnie Jackson, MBA director. The School of Business also recognizes that a student with a STEM or other liberal arts degree has the analytical capability for an MBA program and the boot camp applies their knowledge to the specifics of the business world, Jackson said. The MBA boot camp is a two-credit-hour course with online modules in accounting, finance, economics, analytics, marketing and management. Participants then meet for an intensive weekend of lectures, case study and team building exercises. Jess Jacoby was one of the first boot camp participants. The boot camp is offered at the beginning of the fall and spring semesters. For more information, contact Jackson at jacksol@hsu.edu. Henderson State representatives join Hot Springs High School students and staff on the front steps of the Landmark Building in Hot Springs Feb. 7. The students wore their Reddie sunglasses. 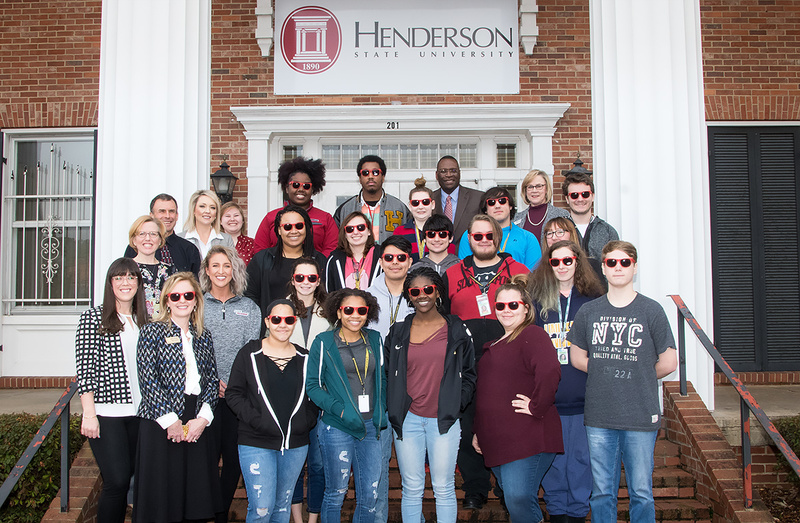 Hot Springs World Class High School seniors who earn a 3.3 GPA and complete one of three academic programs can now earn a Trojan Reddie Scholarship from Henderson State University. The award will cover the gap between their financial aid and scholarship awards and Henderson State’s tuition and fees. No minimum ACT score is required for the scholarship, though students will be required to complete the Free Application for Federal Student Aid (FAFSA). “The Trojan Reddie Scholarship program is designed to focus on students who have the determination to finish a rigorous academic program,” said Dr. Steve Adkison, provost and vice president for academic affairs at Henderson State. “This scholarship does not require a minimum ACT score, as we firmly believe a student’s ACT score is not the sole indicator of college readiness. She cited research showing that Generation Z has learned from millennial mistakes of taking out loans to earn degrees in college. Need a date for Valentine’s Day? 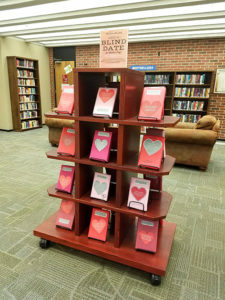 Henderson State University’s Huie Library is holding a “Blind Date with a Book” event during February to match patrons with the perfect book. Students, faculty, staff and community members with a Henderson library card can participate, according to library technician Susie Kirk. A special display has been set up in the library offering a variety of books to choose from. Each book includes a “Rate Your Date” that can be turned in at the circulation desk as an entry to win a $10 Starbucks gift card. Kirk said the display will be available throughout February and entries will be accepted until March 1. For more information, contact Kirk at kirks@hsu.edu or 870-230-5307. Henderson State University’s Department of Music presented its annual President’s Concert Feb. 3 in the Russell Fine Arts Harwood Recital Hall. 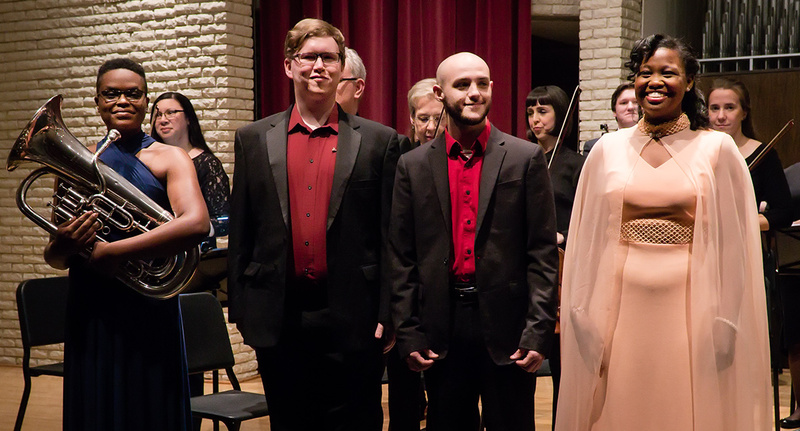 The program featured student soloists selected as winners of a competition in November. The event also honored Wendell O. Evanson, professor of music emeritus at Henderson. Evanson was chair of the music department and director of bands for 30 years until his retirement in 1987. 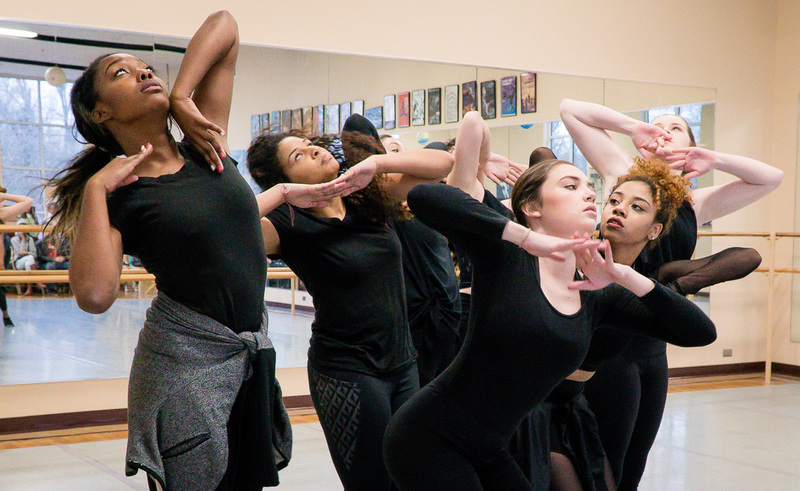 Soloists were Frednesha Whiting, Zaquary Hale, Wesley Lamendola and Raven Morris. 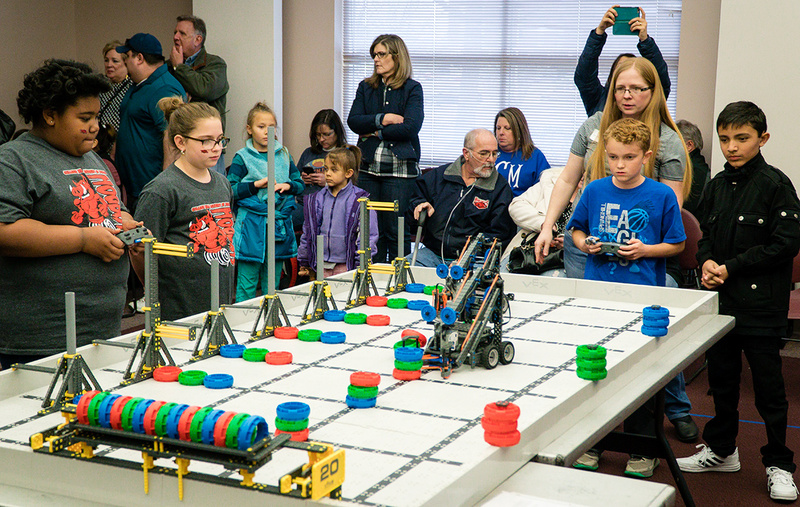 The STEM Center at Henderson State University hosted its first Reddie Robotics VEX IQ Tournament Feb. 3 at the Education Center. Almost 200 junior high school students participated in the competition that measured coding, design, collaboration, interview and engineering skills. The downstairs classrooms were packed as the competitors had their entries inspected, and then polished their operating skills at the practice area. An awards ceremony concluded the event.